Our gallery has occupied a space beside the Green in Settle since 2009. It was a telephone box for many decades before that. 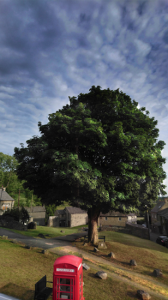 But long before telephone boxes became a feature of the urban, and indeed the rural landscape, in fact just twenty years after the invention of the telephone, a sycamore tree was planted in the middle of the Green to mark Queen Victoria’s diamond jubilee. The tree is now mature and dominates the Green. It has long fascinated Elaine Sargeson who has lived in Upper Settle for the past 18 years. She has photographed the tree from different angles and in different seasons. Her work formed this exhibition. Elaine writes: “The Jubilee Tree has interested me since I became aware of its magestic beauty the first summer I moved to the green. 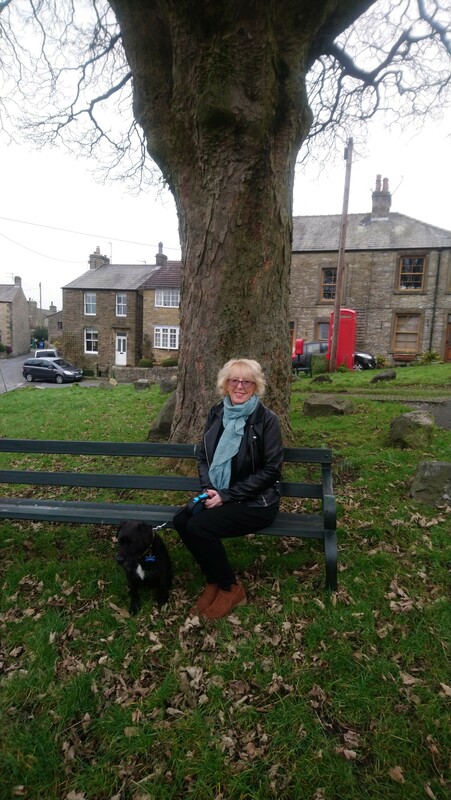 “I noticed walkers often stopped and after reading the plaque informing them that the tree was planted in 1897 to commemorate Queen Victoria’s Diamond Jubilee, they would sit beneath it to enjoy the view of Attermire. “Back then the tree hosted up to fifteen jackdaw/ crow nests each spring. This year, for the first time since I moved here,there were none. Gradually the number of nests has dropped, last year there were just two. This spring’s harsh gales and snow possibly stopped the corvids nesting. “The Jubliee Tree is a Sycamore. It is late, by most standards, to come into leaf. It appears to lose its leaves overnight in autumn when a sudden wind robs it of its still, green leaves. In winter the tree has a quality of its own, even when the tracery of branches are bare it draws the eye upwards. “I began to take photos of the tree in January and decided to take at least one a month for a year. Some of the photos are taken from the green and one or two from my bedroom window. One is taken from a friend’s window. I have tried to capture the tree from all angles,in sunshine and in rain, with blue skies and with grey. Sometimes beautiful sunsets have provided the backdrop. Without the Jubilee Tree the Green would be a different place, everyone loved it.